(Nanowerk News) The number of women involved in science and technology is on the rise especially in developing countries such Thailand. Thanks to institutions such as L'Oreal Thailand and the Thai National Commission for UNESCO for giving recognition and supporting the advancement of women in science and to encourage women to continue careers in scientific fields. The annual "L'OREAL-UNESCO for Women in Science" fellowship is awarded to women working in doctoral and post-doctoral research who have already distinguished themselves in the life sciences. "The main objective of my research is to study encapsulation technology to assist in controlling release characteristics, retention, and enhanced stability against heat, moisture and light of bioactive compounds" said Dr. Uracha Ruktanonchai from NANOTEC a recipients of the fellowship. "Effective encapsulation technology can help not only to save costs but also to provide better product performance. This research mainly focuses on materials and resources available in Thailand such as herbs, essential oils and proteins. Successful examples of this research are nanoemulsion-based cream and chilli pads for arthritis patients, nanoemulsion for mosquito repellent, nanoparticle based on sugarcane bagasse, which can be beneficial not only to pharmaceutical , but also to food and agriculture industries by providing better efficacy, quality and safety for consumers. I hope my research can be of wide-reaching benefit, especially for Thai industrial sectors. I would like my works to be an inspiration for young generation to have an interest in sciences; this would be my contribution to society". Dr. Uracha Rungsardthong Ruktanonchai, NanoDelivery System Laboratory, National Nanotechnology Center, NANOTEC for her contribution to "Development of Encapsulation technology based on lipid nano carriers for bio applications"
Assistant Professor Dr Hathaikarn Manuspiya from the Petroleum and Petrochemical College, Chulalongkorn University for her study on the "Development of Mesoporous Materials for entrapping heavy metals and gases in packaging for a better quality of food and water"
Dr Natini Jinawath from the Research Center, Faculty of Medicine Ramathibodi Hospital, Mahidol University for her study in "Genome-wide single nucleotide polymorphism (SNP) array as a clinical diagnostic tool for unexplained developmental disabilities and congenital anomalies"
Dr Saengchan Senapin National Center for Genetic Engineering and Biotechnology (BIOTEC) for her research on the "Study of shrimp molecular biology using yeast two-hybrid technique." 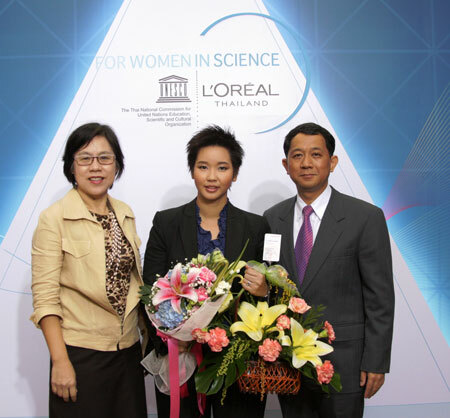 The 'For Women in Science' fellowship programme is a collaboration between L'Oréal Thailand and the Secretariat of the National Commission for UNESCO. The fellowship programme was established in Thailand in 2002, offering four fellowships per year (two Material Science and two Life Science), valued at Baht 200,000 per fellowship for female scientists and researchers aged between 25-40 years.